If you love parrots, and even if you don’t, you’ve probably heard of Alex the African Grey. 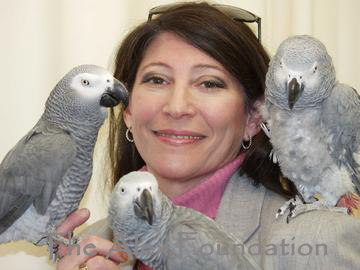 The woman behind Alex’s accomplishments and the research that showed the world that parrots don’t just mimic but actually understand language was Dr. Irene Pepperberg, adjunct associate professor at Brandeis University. The main focus of her work with parrots is to determine the cognitive and communicative abilities of these birds, and compare their abilities with those of great apes, marine mammals, and young children. She studies the mechanisms of their learning as well as the outcomes. In 2008, she published (and I reviewed) her memoir “Alex & Me.” This year, a new film about Alex was released called “Life with Alex“. Dr. Pepperberg was kind enough to participate in an interview for our blog. Q: First of all, everyone wants to know: how are Griffin and Wart doing? Can you share what they’re working on? Dr. Pepperberg: Both are doing quite well…we have one paper in press on their ability to work together to maximize payoff (Griff does to some extent; Arthur is selfish) and another paper accepted pending revision showing that they can both reason by exclusion–that is, choose location X when they know that a treat is not at location Y, and show they know exactly what is at X and Y. We are following up on the reciprocity research with both birds, and Griffin is almost done with a study on optical illusions. Q: What’s a common misconception people seem to have about you and your work that you’d like to dispel? That Alex was some kind of avian “Einstein”. He had the advantage of being an “only” bird for his first 15 yrs in the lab, with a small army of humans treating him like a toddler. Griffin always had to share this attention, and Alex interrupted all Grif’s sessions. Too, we tried out some training methods with Griffin that proved unsuccessful (audio and video tutoring), so he has had less overall effective tutoring that Alex. That said, Alex seemed more interested in solving problems, but more so later in life, so there’s still that possibility for Grif and Arthur. Q: You’ve been known to say that parrots have the intelligence of a small child. Do you still feel this is an apt and useful comparison? For the general public, yes. Not only to gauge parrot intelligence, but also to understand the type of enriched environment that is required to keep these birds happy and healthy. Q: My friends from Facebook want to know: Do you feel that African Greys are special or smarter than other types of parrots? Could you teach a different species the same things you taught Alex? Have no idea! I could answer that question only by working with other species, and that isn’t going to happen at this point. Q: What inspired you to share a more personal part of your own life in the book? Actually, it was my publisher who pushed for those bits….although in retrospect, I can see how my story could inspire other young people. Q: Please tell our readers about your new film. How is it different from the book and what would you like viewers to be get out of it? “Life with Alex” is a memoir, told more from the standpoint of my lab manager, Arlene Levin Rowe, than from mine. It gives the public a feel for the birds’ daily lives and their personalities, how they play as well as work, how they interact with their human partners, things that come through more clearly in video than in the printed word. Q: What was the hardest part of continuing your work after Alex died? Primarily, simply missing him. Secondarily, realizing that many of the studies we planned may not be done, because Griffin and Arthur still need to learn a lot to be able to be tested in those ways. Q: A really important part of science is for other people to be able to replicate findings. Are there currently other people doing similar work that will be able to carry the mantel moving forward? Not exactly, although there’s a terrific group at the University of Vienna that is looking at cognition rather than communication in Greys, and making some outstanding progress, with keas as well as Greys; they also plan to work with cockatoos. Two other groups that were looking at communication did not replicate my training techniques or the environment of the birds, and thus could not replicate my findings. Q: What is some of the most interesting animal research happening in the field right now? Lots of work being done on a large number of different avian species–corvids and parrots–to determine their intelligence. Mostly being done in the UK and in Austria, however. Q: Anything else you’d like my readers to know? That funding for this type research is still close to nonexistent in the US, and that we are dependent right now exclusively upon The Alex Foundation to keep the lab open and running. Photo by Mike Lovett. A big thanks to Dr. Pepperberg and Arlene Levin for their help with this interview. For more background and videos, check out my book review of Alex & Me.